TO SEE OUR HOLIDAY VIDEO, PLEASE CLICK ON THE PICTURE ABOVE. 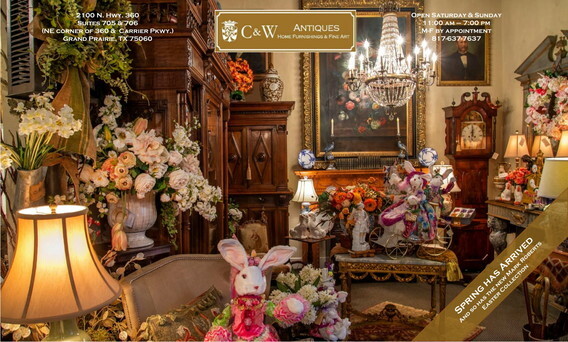 C & W Antiques, Fine Art and Home Furnishings is a unique shopping experience in the Dallas / Fort Worth area. Guests can expect superior customer service with attention to detail that is unparalleled in the industry. We specialize in English and French antiques and original fine art from acclaimed Italian, French, Russian, English, and American artists. The art collection was hand selected from accomplished artists whose work adorns national museums and exhibition halls throughout Europe, Russia, and the United States. Elegance abounds from the crystal chandeliers, fine, one of a kind, 17th, 18th, and 19th century antiques to Iranian hand woven carpets and our outstanding art collection. A rich hunting ambiance greets our customers as they stroll through time into the English and French manor house settings. Visit our showroom at 2100 N Hwy 360, DFW Corporate Park, Suite 705-706, in Grand Prairie, Texas, open Saturday & Sunday from 11am-7pm, and Monday through Friday by appointment only. Call 817-637-7637 for an appointment. We also invite you to visit our suites at Montgomery Street Antique Mall on Aisles 4 and 5, Dealer 913. Our Montgomery Street hours are 10-6 from Monday through Saturday, and 12-6 Sunday.